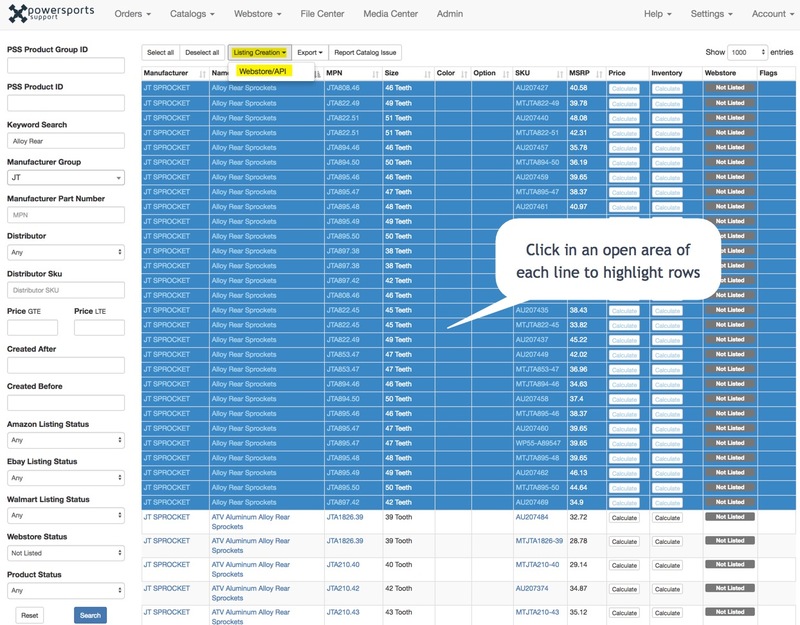 Your webstore will come loaded with the entire PSS catalog for the distributors that you utilize. As time goes on more product will become available and you will want to add these products to your store. You have two options for this. You can email support@powersportsuppot.com at any time and ask us to load the most current Product Mapping File. This will get your store up to date with all the latest product. Note: The products will utilize our category structure. If you have a custom category structure you will need to proceed with the second option. On a weekly or monthly basis you will want to locate any new product that you wish to list. You will list this product to your webstore using the PSS user interface. In the PSS Catalog use the filters on the left to narrow down your results to the exact product you wish to list. 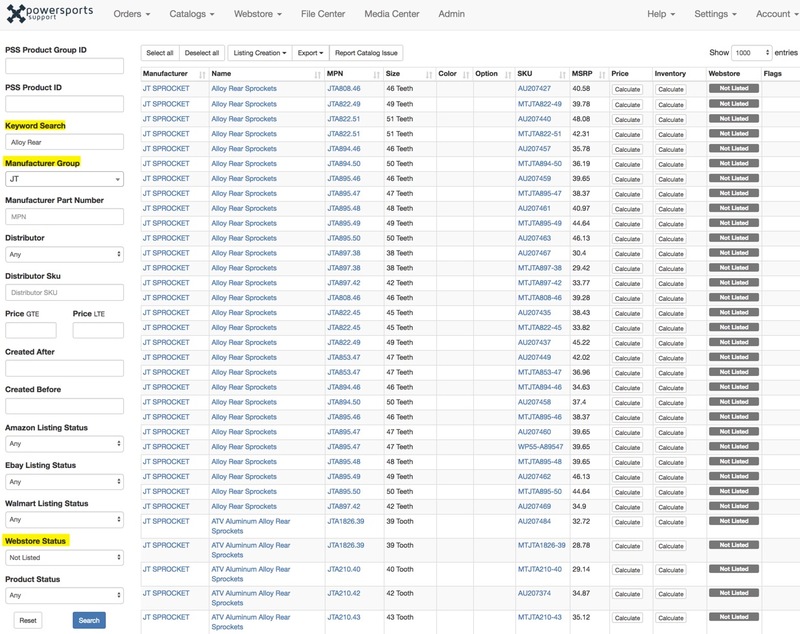 Start with the filter titled "Webstore Status: Unlisted" and drill down from there. Use Manufacturer Group and Keyword Search. Highlight the Products that you wish to list. Note: If you list one Product within a Product Group the entire Product Group will list. After you click the Listing Creation button you will have a chance to choose the category that you want the product to display in. You will also be able to list the product as a featured item on the homepage of your webstore. 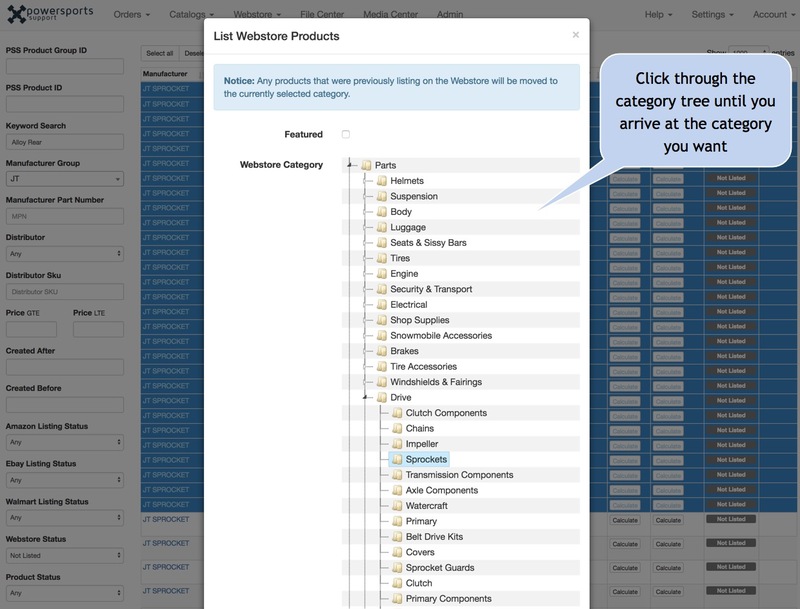 Simply double click through the category tree until you reach the exact category location you wish to list to. Your products should list to the PSS Webstore within an hour. Often times much faster.